Yeovil Bank was a private bank established by Yeovil attorney Samuel Watts the Elder. Watts was listed as a proctor (attorney) in the Universal British Directory of 1790 and as a solicitor of Kingstone (Kingston) in Pigot's Directory of 1824. Private banks were allowed to issue notes but were restricted to six partners or less. The big runs on these private banks occurred in 1825, and new legislation was then introduced. The Yeovil Bank was probably founded around 1810, was a private bank established by Samuel Watts the Elder (when aged about 76) and it is possible that his bank was located at today's 1&3 Princes Street - certainly his sons' bank was later located here. It is surely not unreasonable to speculate that the bank of the sons was a continuation of the bank of the father, albeit under different names. A reference in the London Gazette in 1812 refers to the bank as Watts Marsh & Co (run by Samuel the Elder's sons Samuel and Joseph Watts and Thomas Marsh). The John Nossiter bankruptcy of 1815 has as one of his creditors Messrs Watts Marsh & Bullock & Co. Later in 1815 it was announced that this banking partnership was dissolved by mutual consent under the signatures of Samuel Watts the Younger, Thomas Marsh, Thomas Bullock, and James Glyde. Daniel Vickery, writing in 1856, referred to Yeovil's third bank as Samuel Joseph Watts and Cayme, noting ".... In the premises (that is, today's 1 & 3 Princes Street) now occupied by Mr Wilmott, confectioner, was the Bank of Messrs. Samuel (and) Joseph Watts and Cayme." (See below regarding George Willmott as occupier in 1851 and 1861). By 1822 (Pigot's Directory) the bank had become Samuel Watts & Co. It would then have gone out of business on 8 November 1823, when Samuel Watts the Younger, scrivener and banker, was declared bankrupt. The Yeovil Bank went down early probably because of the loss of confidence that came with the failure of the Watts and James Cayme the Younger enterprises on Wine Street. 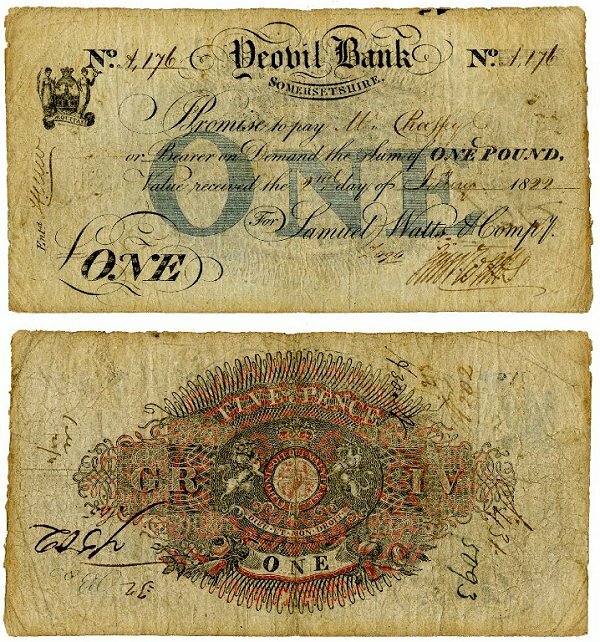 The banknote illustrated below indicates that the Yeovil Bank was active in the 1820s. The obverse and reverse of a Yeovil Bank £1 note of 1822 (about £77 at today's value).